100,000 tweets and keep on clicking.. I've been on Twitter for more than 2 years and originally used the tool because I was curious and also afraid I would lose my job at a communications company due to the economy at the time. I thought Twitter would be the best means to facilitate networking and job opportunities in my field. Fortunately I'm happy to be employed and have found that Twitter has become more than just a tool. It has become a Swiss Army tool for me. It has done more than I can imagine. From a free trip to San Francisco to the use of a free car and numerous events/gifts and most importantly being able to interact, communicate and engage with you. To you reading this post and following my tweets I "Thank You" sincerely. For those that know me or have met me in person, I try to set an example of being someone that is a positive member to the community especially online. We all have our faults but trying to overcome them is the challenge. Having you all follow my "day to day" adventures is an outlet to share and learn from our experiences both bad and good. It cultivates conversation and instigates dialogue and just being social. I've learned a lot from many of you that I follow on Twitter. I am thankful for that. 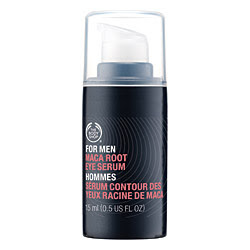 Disclosure: I have been given the opportunity to try out some Body Shop product for Men. At first thought, I did not know that Body Shop had Men's products for sale in store. I always thought of Body Shop as the great smelling store your mother or girlfriend would spend hours in shopping. The last time I went into a Body Shop was probably to buy their popular gift baskets for those last minute birthdays or celebrations. It is great timing to try the Men's Body Shop line because I'm in the midst of trying different products but at a reasonable and affordable price. I'm the type of guy that will use Edge shaving cream for $2.99 or to the other extreme in price value of Kiehl's or Anthony for Men for about $20.00 a product. This is Edge Gillette shaving cream. Messy and foamy if you like that type of shaving cream. This is Maca Root shaving cream. Not messy and not foamy. Better lather on the skin. IMHO. My favourite item is probably the shaving cream. I'm not a fan of the whippy and messy shaving cream that are available at the cheaper price points. Waking up in the morning and having to shave should be a quick clean and simple process. I like how it lathers with just a small amount in hand. It does not get all messy and it truly makes for a better shave with razor. It coats your skin with a thin layer so you can see which areas you need to hit unlike foamy shaving creams. The Maca Root shaving cream is very similar to "Anthony for Men" but at half the price. I would recommend using this product for sure. Best value for $10.00 a bottle.